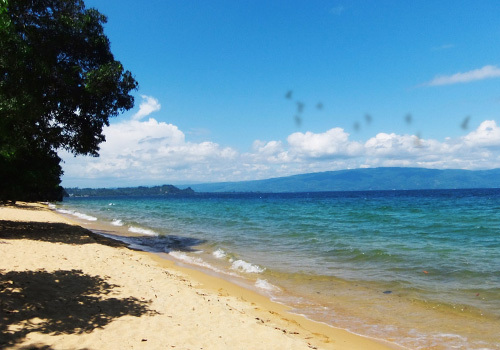 Siuri beach is tourism site that located in the edge of Poso Lake. Siuri has yellowish brown sand with sparkling gold during the day. This place is the nearest destination that can be visit to enjoy sunset and playing at the calm water around the beach. The other thing that interesting to be seen is when we can see the beauty of Poso Lake. Siuri is mostly visited by local tourist but today foreigners are notice about this place. Siuri beach is located in Toinasa village, Pamona Barat sub-district and it can be reach along 17 Km from Tentena city by using private vehicle, either two-wheel or four-wheel drive. Those who want to stay around this beach can enjoy some of facilities like cottages, and enjoy the nature more. Siuri will be more crowd during weekend or holidays and will be more dramatic during sunset. Sometimes, local people come to this beach and enjoy their own activity like roasting the fishes, having beach volley or just sitting around and singing with guitar.